Miramax has been around long enough that they’re starting to re-release titles from their vaults. The latest batch of DVDs gets the “Collector’s Series” stamp, and it includes Trainspotting, David O. Russell’s Flirting with Disaster, and Cop Land. The movie is set in the aptly named town of Garrison, NJ, right across the bridge from New York City. About thirty NYC cops and their families live in Garrison, away from the crime and the slime of the big city. A deaf ear kept Freddy Heflin (Sylvester Stallone) from joining New York’s Finest, so he became the sheriff of “Cop Land.” In contrast to the cops across the bridge, Freddy’s days are spent retrieving stuffed animals and resolving tiffs between neighbors. When the New York cops cover up a case of brutality and murder by bringing their comrade to Garrison, Freddy is faced with a moral dilemma. The movie is intellectually engaging, but the “cop” aspect offers nothing that you can’t get on prime time TV. When Robert de Niro as the archetypal “police chief” explodes in frustration, it is so much like every other cop movie that you wonder if director Mangold is poking fun at the genre or just being lazy. Much has been said about Sylvester Stallone. He is trying to shed his action-movie persona and get into meatier roles, starting with this one. He isn’t outstanding, but he is better than usual and better than most people are giving him credit for. The most obvious difference in Stallone is not the 20 pounds he gained, but the expression he wears on his face. Instead of a hostile, indifferent scowl, he has a naïve, insecure grin. The new DVD presents the director’s cut, returning 12 minutes of film to the screen. There were scenes I didn’t recognize, including a shot of Stallone’s big morning belly, but no new plot elements were introduced. According to the audio commentary, most of the 12 minutes fleshes out scenes that already exist. Looking at this film, and looking at Stallone’s career since then (Driven, Spy Kids 3, Get Carter), it’s clearer than ever that this is Sly’s best role since Rocky. Freddy’s humility and sadness runs counter to everything Stallone is about, and he’s never matched this performance. Still, my original lack of enthusiasm remains apt. There are brilliant moments in Cop Land, particularly at the film’s climax. And Mangold’s vision of the film as an urban Western makes more sense in this longer cut. But it’s still basically just another cop movie. The other movie-specific extra features are a storyboard comparison sequence that shows how closely Mangold stuck to the design, and a talking-heads featurette about the making of the movie that fails to impress or surprise. There are also two deleted scenes that introduce an element of racial prejudice that were wisely kept out of the director’s cut. 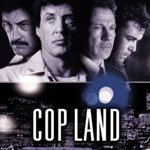 For a 7-year-old movie with restored footage, Cop Land looks very good. There are no noticeable scratches or dirt and the colors and textures are still rich. (The movie is presented in the original 1.85:1 aspect ratio.) The audio track is encoded in Dolby Digital 5.1 surround.